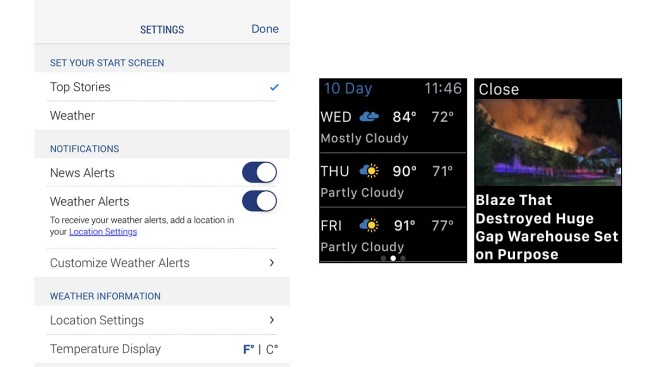 NBC 6's app features enhancements (left) based on your feedback and the app is now made for Apple Watch (right). Introducing our first Apple Watch app! Get breaking news alerts, current weather conditions, the extended forecast and news headlines on your wrist! Allowing you to customize what types of push alerts you receive from our app — news alerts, weather alerts or both. Enhanced readability of our weather section to help you view the most important information the moment you need it. Providing the ability to mute the audio on videos inside of article pages, as well as the ability to turn off autoplay on videos across the app.